Ten Ten Theatre | TEN TEN THEATRE is a national award-winning theatre company. The following article appeared in the Catholic Times on Sunday 22nd December 2o13. I will remember the Year of Faith for an extraordinary project I had the privilege to lead with Ten Ten Theatre throughout Lent 2013. 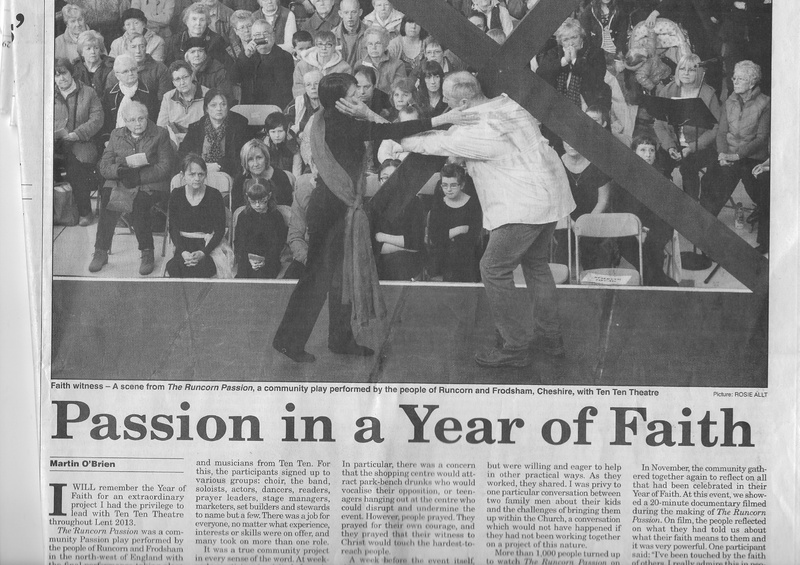 The Runcorn Passion was a community Passion play performed by the people of Runcorn and Frodsham in the northwest of England with the final performance taking place in the town’s main shopping centre on Holy Saturday. An astonishing 250 people from the local community signed up. There were parishioners from the various local Catholic churches, children from primary schools, students from secondary schools, and many from other Christian denominations and communities taking part; the youngest was four, the eldest over 80. Runcorn is my hometown, so this project was very personal to me and also to my family, who founded and run Ten Ten with me. It is a town which is often cited as one of the poorest in the country with high unemployment and poverty rates. Moreover, the structures which support the Catholic faith have been slowly eroded due to a severe shortage of priests and a fragile infrastructure; faith is subsequently becoming increasingly private. So The Runcorn Passion presented a unique opportunity for the church community to come together, find strength in numbers and proclaim what they believe to the wider community. The basis of our passion play was “Born For This”, the beautiful Boyce-Stanley reflection on the Stations of the Cross in words, music and action. Rehearsals took place over a six-week period. Each gathering would begin with a time of prayer and reflection on the Passion of Our Lord, followed by an intense but fun session of rehearsals led by professional actors and musicians from Ten Ten. For this, the participants signed up to various groups: choir, the band, soloists, actors, dancers, readers, prayer leaders, stage managers, marketers, set builders and stewards to name but a few. There was a job for everyone, no matter what experience, interests or skills were on offer, and many took on more than one role. It was a true community project in every sense of the word. At weekends, participants visited shops in the town to display posters in any windows allowed. They hand-delivered flyers about the event to letterboxes throughout Runcorn and Frodsham; the first print-run of 10,000 were dispatched within four days and so a further 10,000 were ordered and quickly delivered. Children in primary schools worked hard learning songs and sign language, as part of their contribution. The community manipulated every press opportunity available to them, and as result the event was featured in many local newspapers as well as given a prime spot on the local BBC radio station. One well-known disc jockey who lives in Runcorn was assaulted with dozens of emails and calls from local people asking if he could help! It became evident quite early on that many of the people taking part were being deeply touched by reflecting on Christ’s Passion in this way. Each week, we invited participants to write responses to various prompt questions, which proved humble reading; the overwhelming response to the question of ‘what does faith means to you?’ was simply “everything”. As the final performance at Halton Lea shopping centre approached, so did a growing conviction amongst the participants that they wanted to proclaim their faith to their neighbours, their colleagues, their friends. There was also, naturally, a reticence. In particular, there was a concern that the shopping centre would attract park-bench drunks who would vocalise their opposition, or teenagers hanging out at the centre who could disrupt and undermine the event. However, people prayed. They prayed for their own courage, and they prayed that their witness to Christ would touch the hardest-to-reach people. A week before the event itself, the project was thrown into jeopardy. As the entire company of 250 were about to come together for the one-and-only chance to put all of the elements of the production together, starting with a Mass celebrated by Bishop Mark Davies, the town of Runcorn was buried underneath a rush of snow. Many roads were shut. The school where rehearsals were due to take place had closed down. The pathway to the hall was lethally icy. We thought that was the end of it. Without a dress rehearsal, the performance would simply not be ready. Then, shortly before 9am on that cold, snowy, dazzlingly white Saturday morning, the first of the participants turned up at the rehearsal venue with a shovel. Then the next one arrived. Then the next. By 9.30am there were dozens of us clearing the snow from the car park. By 10am, half of the participants had turned up and were able to get into the rehearsal venue. By 10.30am, all but a handful had been able to make it, with some trekking miles across town through the snow to get there. The faithful, Spirit-led determination of the community was remarkable. On Good Friday evening, men from the local community erected a huge stage and PA system in the centre of the shopping centre. Many of these men had not wanted to take part in the performance itself but were willing and eager to help in other practical ways. As they worked, they shared. I was privy to one particular conversation between two family men about their kids and the challenges of bringing them up within the Church, a conversation which would not have happened if they had not been working together on a project of this nature. There were one or two moments of disruption when, for example, a drunk made disparaging comments, and a group of teenagers shouted from a distance, but these were drowned out by moments of utter silence and stillness, creating an extraordinary feeling of reverence and prayer on a busy weekend for shoppers. It was a true witness of faith in a very public sphere. The same weekend as we celebrated the end of the Year of Faith with the community, it was confirmed that a number of parishes in Runcorn would be merging due to a long-term shortage of priests. The challenges for such a change are great; indeed, parishes all over the UK are facing similar challenges. In Evangelii Gaudium, Pope Francis talks about Pastoral Ministry at a local level. He says, “I invite everyone to be bold and creative in this task of rethinking the goals, structures, style and methods of evangelization in their respective communities.” The people of Runcorn and Frodsham achieved precisely this. For The Runcorn Passion proved that, despite the hardship, faith is still strong within these communities. Through faith, the ordinary become extraordinary, the spiritual meets the practical, the lost are found, and the person of Jesus Christ becomes tangible, real and very much alive. A 15-minute documentary film, “The Story of The Runcorn Passion”, has been released and can be watched here. Actors Jessica Kennedy and Ben Riddle will appear in Ten Ten Theatre’s double bill of Babies and Chased at the Tristan Bates Theatre on the 26th April at 2 pm. The plays will be facilitated by actor Prisca Shallcross who has also been touring with the team over the past few months. Here is a cyber-interview about their experience. Enjoy! 1. 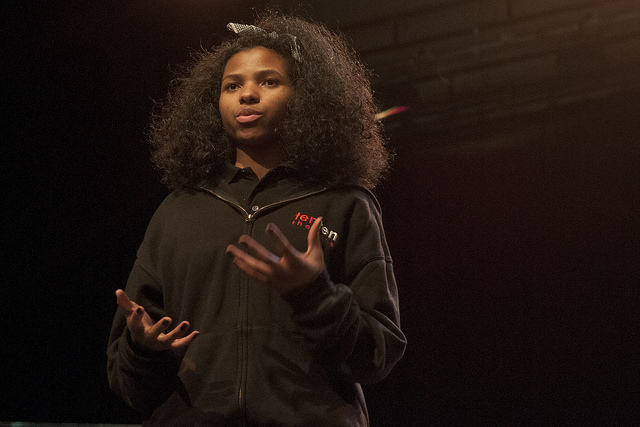 What do you enjoy about acting/facilitating in secondary schools? Because the students are not in a “class-room” setting, they have a boundless enthusiasm which is great to watch as a facilitator and great to feed off as actors. It’s rewarding as a facilitator to engage with students at different age groups and to encourage them out of their comfort zones. Especially when I get students giving really in depth responses and they can be open and brave enough to share their opinion in front of peers. 2. Out of the three plays – Babies, Chased and Two Faced – do you have a favourite? If so, which one is it and why? We all like Babies because it’s a concise and dramatic play, it has everything it needs; there’s a good journey for all characters involved and has great impact on the students. It has the best facilitation to challenge both the actors and audience. As a facilitator it’s always interesting to see the shift in the room change from ‘this is just a play’ mentality into ‘oh, this is a serious topic and issue’ which could happen to any of us. 3. What impact do you think these plays have on the lives of the students? Of the three plays Two-Faced seems the most relevant to the age group as the pressures of fitting in and social networking are very much a daily pressure they deal with. The students can all relate in some way to the pressures of identity. All three plays at the very least engage with students on a personal level and give them a chance to reflect on their relationships. Occasionally we can see that some students go away inspired to either join a company similar to Ten Ten or they have felt more secure about who they are (i.e. Some girls after watching Chased feel more at peace and happy about being a virgin) similarly from watching Two-Faced some students feel a real sense of embarrassment about their own behaviour because the play reflects how they are, so for some students it’s a brilliant time for them to just analyse their own lives and relationships to others. 4. As an actor/facilitator what is the most challenging thing about touring for several months? The most challenging thing is the early starts; it’s a great discipline we have to get used to and it can often leave you feeling drained after the day’s work, but it’s vital that we have good team spirit to keep us all together and persevere with the work at the high standards expected. As a facilitator the harder part can also be trying to get the students to respond when they have no energy and are very reluctant to participate. 5. If you could choose 5 words to describe your experience touring with Ten Ten, which ones would they be? Rewarding – the impact we have on some of the kids and how much they take away from it. Personal testimonies of the students when they make an effort to come up to us after the show and tell us they enjoyed it and think it’s a great thing we do. Challenging – it has a physical challenge because every day we are unloading and loading equipment and it has significant effects on the body; lots of tension. However you get used to it and we get into a good routine together as a team and it helps bond us as a team. Inspiring – it always gives me joy as a facilitator to know that the staff at the schools continue to hire Ten Ten year after year, the strong relationships which have been built over the years shows the strength of the company. It is a great thing to be a part of a big family. As actors it has taught us to be disciplined on a daily basis and helped strengthen endurance ability. Usually with theatre jobs you’re more used to working in the evenings, but adjusting to early starts and afternoon performances has helped with strengthening our performance standards. Variety – each day we are working with different people and different schools. Although the material is the same; we keep it fresh because each day is new and each school gives us our own set of challenges/hospitality. Liberating – there is such a sense of freedom in the tour, especially being able to stay in your own room and having your own space is vital! This is truly key. We all love the fact that we get to see different parts of the world in the UK and it’s nice to come back to familiar places (if you’re used to working with Ten Ten). There is a good sense of trust and independence within the whole company- Martin trusts his teams to deliver and the team do their best to meet Ten Ten standards. All in all an experience with lots of learning curbs, great fun when the target is reached and it tests your own character. How will you cope with such a small team? How do you cope with being away from home? How do you relate to the faith ethic? All these factors help grow and mature us as people not just employees. Actors Sam and Tracey will appear in Ten Ten Theatre’s double bill of Freedom Fighter and Called Up at the Tristan Bates Theatre on the 8th February at 2 pm. They have both been touring with Ten Ten since May 2013 and here they give an interview about their experience. 1. How has the tour been for you so far? The tour has been a great experience. It’s wonderful to see how the children respond to each play. And we always get such a great response from the teachers. 2. What do you think children get from Freedom Fighter and Called Up? FF – Helps the children to understand ‘why’ rules are in place. 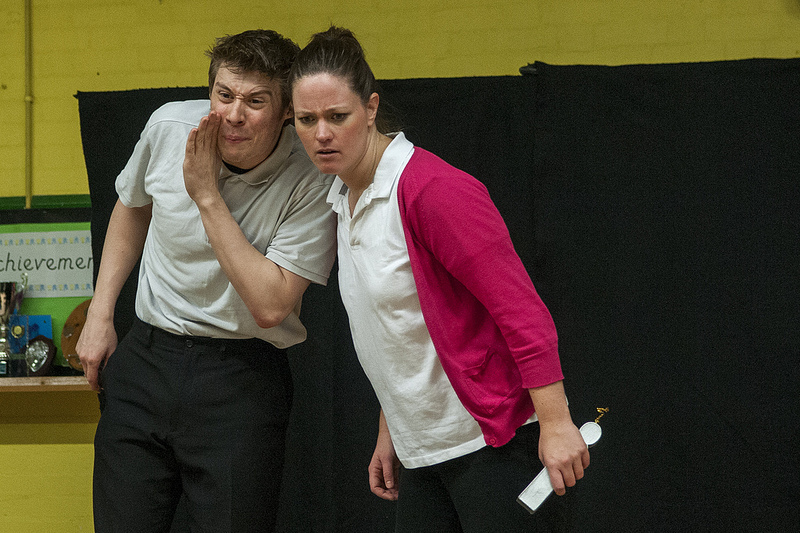 Through its Panto style comedy, the children can help Ginny to make good decisions regarding the rules. The follow up session consolidates this and challenges them to describe why particular rules are there. CU – presents situations of change and uncertainty to children, but it addresses and resolves these issues through love and nurturing. The follow up session encourages them not to give up in times of change and to recognize that they have been created uniquely, and in God’s Perfect image. 3. Can you share your most memorable experience from the parents sessions you’ve led every day? Called Up seems to invoke a lot of emotion from parents, especially when their children are making the transition into secondary school. We have had parents who have been brought to tears when sharing their experiences with us, which has inspired us in our work, in the knowledge of the effect it may be having on some families. 4. Why do you think families should not miss Ten Ten’s double bill of Freedom Fighter and Called Up at Tristan Bates Theatre? It is a chance for parents to either see what their children have seen, and in turn create a dialogue in the family. It also allows children who have not seen the plays to enjoy the theatre, while being encouraged by the moral and Spiritual themes. 5. What’s been your favourite thing about touring with Ten Ten? Ten Ten are a nurturing company and this comes out in the work, but also in the way they support and encourage their staff. It has been a pleasure working with them. It has also been a blessing to perform the plays. 6. And your biggest challenge? The biggest challenge has been the length of the tour. It has been a great test of our character, but also a test of our acting skills. It has taught us how to work at keeping things fresh. 7. If you had to describe the tour in a hashtag what would it be?